In 2010 we brought you our photo series “Music Legends With Cats,” and now in 2011 we are reprising the series, but this time with photos of man’s best friend. Stay tuned for more “Music legends With Dogs,” our new weekly series. That’s Geraldine the Wonder Dog. She was a great hunter and so good with children, we called her the Babysitter. She lived to be 17 and I was with her holding her paw when we had to put her down. 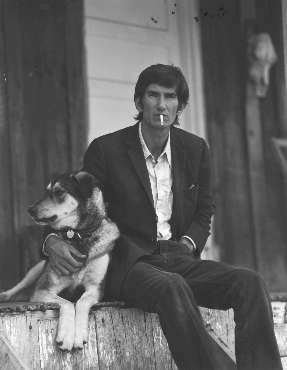 No doubt she’s running with Townes in Heaven now. God Bless.